Dental veneers are placed over the fronts of teeth to enhance their appearance. Veneers are thin sheets of material, typically porcelain, that can make teeth appear whiter and straighter. Veneers can cover teeth that are discolored, uneven, or slightly damaged for a more beautiful smile. While the dentist will securely attach dental veneers to last for many years, proper care at home will increase the chance that veneers will remain in place. Brush teeth twice each day and floss daily as you normally would to reduce plaque, acids, and bacteria that could damage the bonding material. Use a mouthwash if recommended by the dentist. Reduce or eliminate use of alcohol or tobacco to help veneers last longer. In addition, the dentist may recommend that you reduce the amount of potentially tooth-staining foods and beverages that you consume to eliminate any risk of staining. If you clench or grind your teeth, you may need to wear a bite guard to protect veneers. Do not bite your nails or other hard items with veneers. 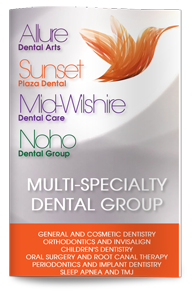 Make an appointment to see our cosmetic dentist in West Hollywood for regular dental care visits and to check on the stability and security of your veneers to help them last longer. The dentist can offer recommendations based on your individual situation. If you are interested in veneers, or if you need more information on how to properly care for veneers that you already have, our expert in dental veneers in West Hollywood can help.